A chair that not only feels comfortable but also adds an added special touch to the decor of an office? The Pikaia ergonomic office chair is an example of just that. The minimalistic design is simple enough to fit in anywhere and because of its clean lines it will stand the test of time. The Pikaia office chair series is available in four different colours while the metallic structure can be made in a chrome finish or coloured to match the seat. Our selection of colours is chosen to match easily in a variety of different settings while at the same time catching the eye. The chair is designed to support the back fully. 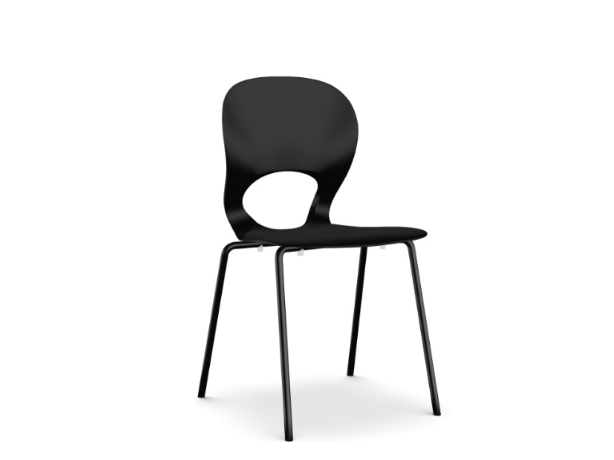 The curve of the backrest easily and comfortably follows the natural curve of the spine. The polyurethane shell, however, also allows for flexibility letting you lean back slightly. Like the human body is constantly in motion, the chair moves with it in a natural and supportive fashion. Whether in need of a light office chair with arm support or a stylish office chair you can stack, the Pikaia ergonomic office chair can be either. Suitable to both office settings and other situations, the high versatility of this seat make it an instant classic and paired with the ability to personally select the colour of both seat and frame, its popularity is easily explained.